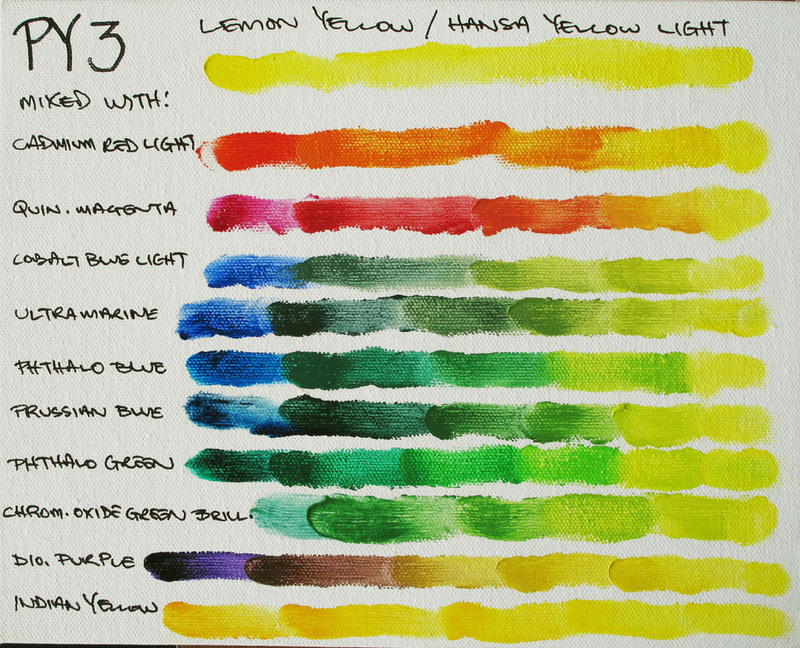 PY3 Lemon Yellow is a cool primary yellow that mixes cleanly to produce a large range of colours, especially greens. Bearing in mind that these are only 2 colour mixes - a much larger range is available by introducing another colour into these greens, e.g. black. The purple darkens the yellow, down to some yummy browns. PY150 is called Translucent Yellow by Schmincke & Nickel Yellow Azo by Golden. It's a dull ochre in masstone (thick paint layer) but a fiery yellow in undertone (thin layer). It's one of the two main translucent yellows (the other being Indian Yellow) and is a good replacement for the toxic and weak-strengthed Aureolin. 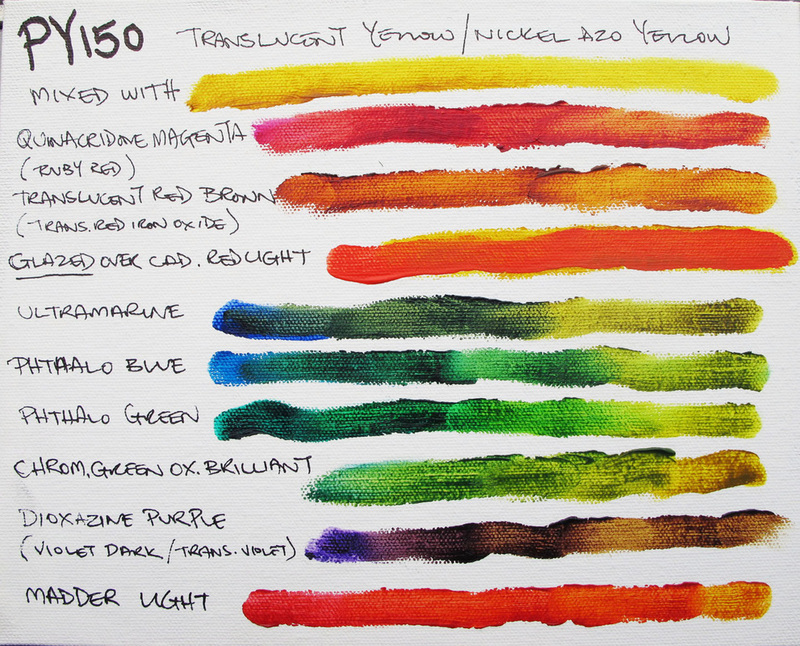 PY150 produces blood-red through to burnt orange with Quinacridone Magenta, fiery earth tones when mixed with red earths, its glaze adds depth to reds, and it combines well with blues and greens to make a range of warm greens. Dioxazine Purple reduces it to a tarry black! PY184 Vanadium Yellow (Light) is a bright, cool yellow that is opaque and has a high tinting strength. Vanadium is available in both a Light and Deep tone and provides an important cadmium-free alternative to Cadmium Yellow, which may not be around for too much longer due to environmental issues. 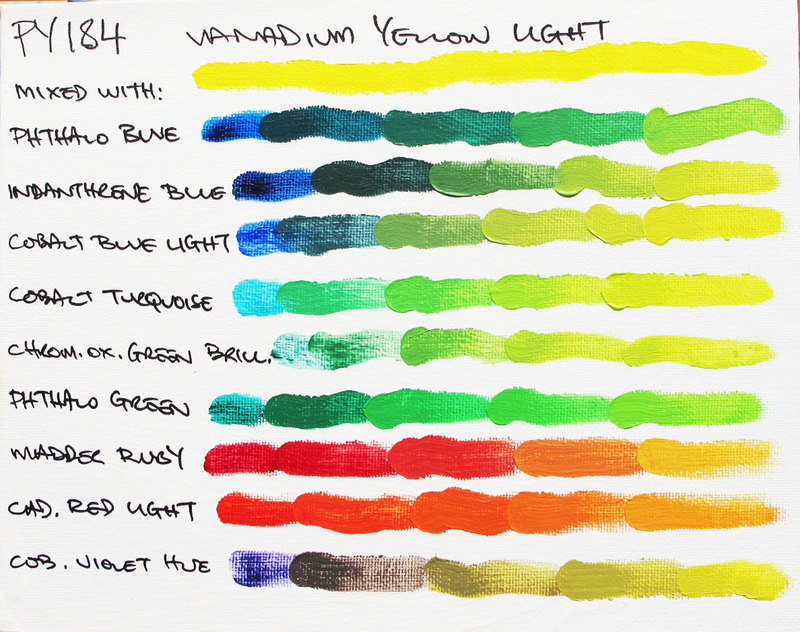 Vanadium Yellow is a very modern pigment that offers very bright, modern mixing opportunities, especially with Cobalt Turquoise (PG50), where almost fluorescent greens occur. 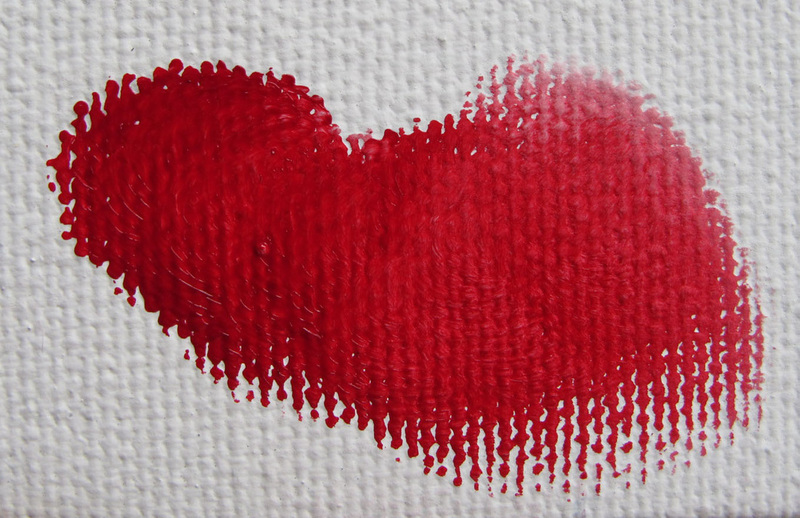 Its high tinting strength and opacity make it perfect for combining with Cadmium Reds. 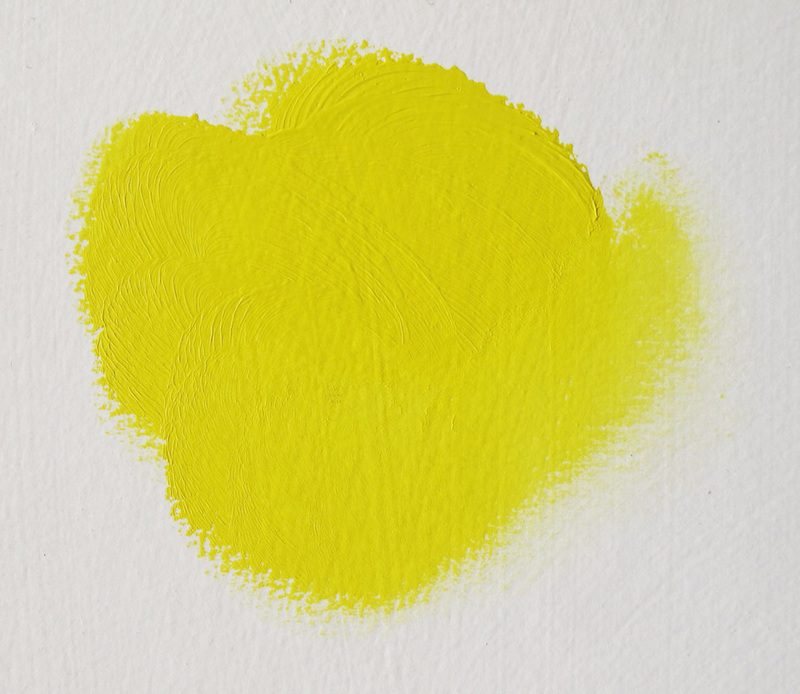 PY155 is used as a cadmium-free replacement for warmer Cadmium Yellows, and is usually called Cadmium Yellow Tone or Brilliant Yellow (not to be confused with Jaune Brilliant Brilliant Yellow). It has a good opacity & lightfastness, and is warm in masstone through to pale neutral yellow in undertone. 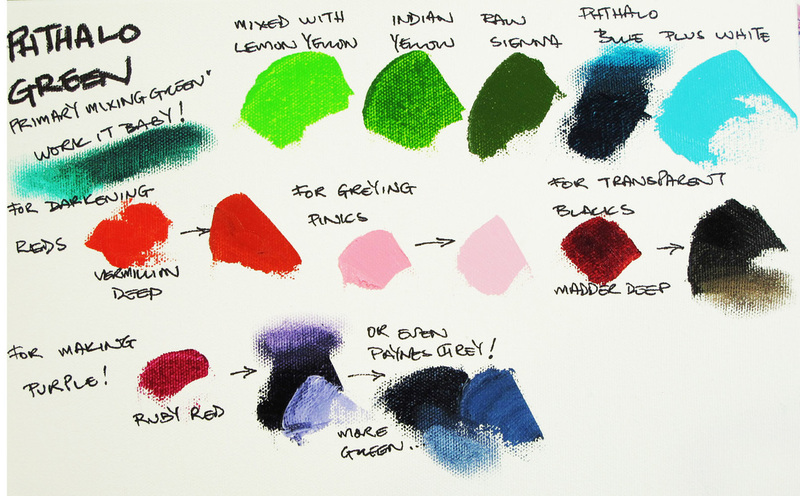 A small amount of PY155 mixed with blues creates muted turquoise hues (more evident on the sample board than this photo) while the addition of more makes a range of warm and vibrant greens. 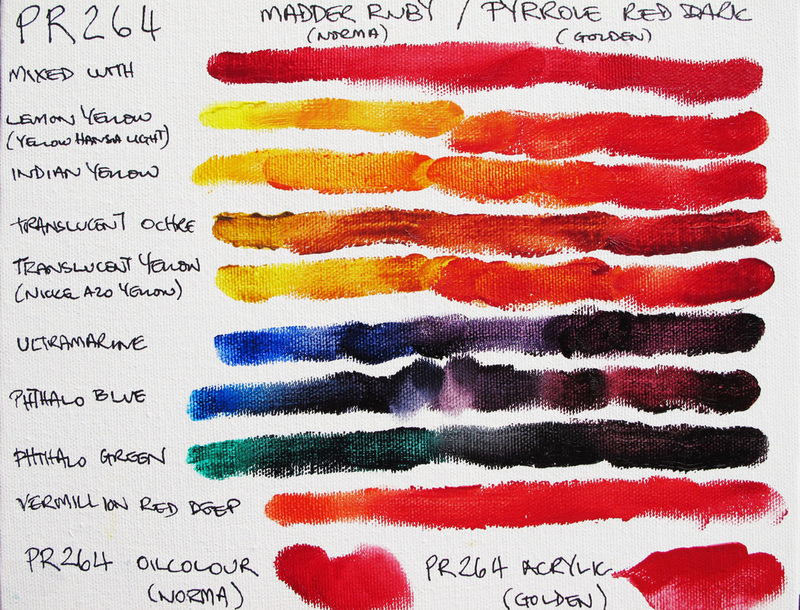 Kikuyu greens result from a mixture with Phthalo Green, and PY155 combines very well with strong pyrrole reds such a Vermillion to create warm oranges and yellows. 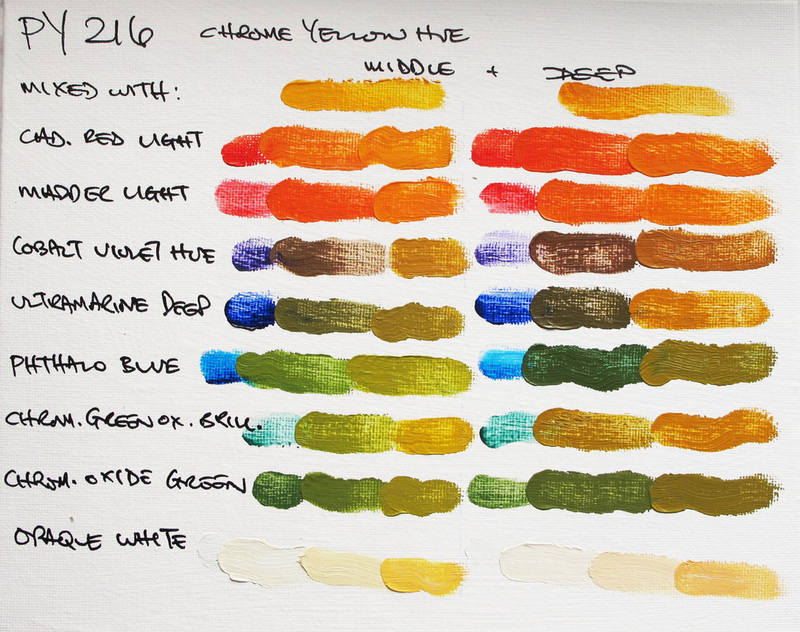 PY216 is a very new opaque pigment that Schmincke have used to imitate the (toxic) chrome yellows of the 19th Century. It makes warm yellows with a slightly dull chroma, and is altered to produce both Middle and Deep tones (the Light tone is made by combining PY216 with PY53). 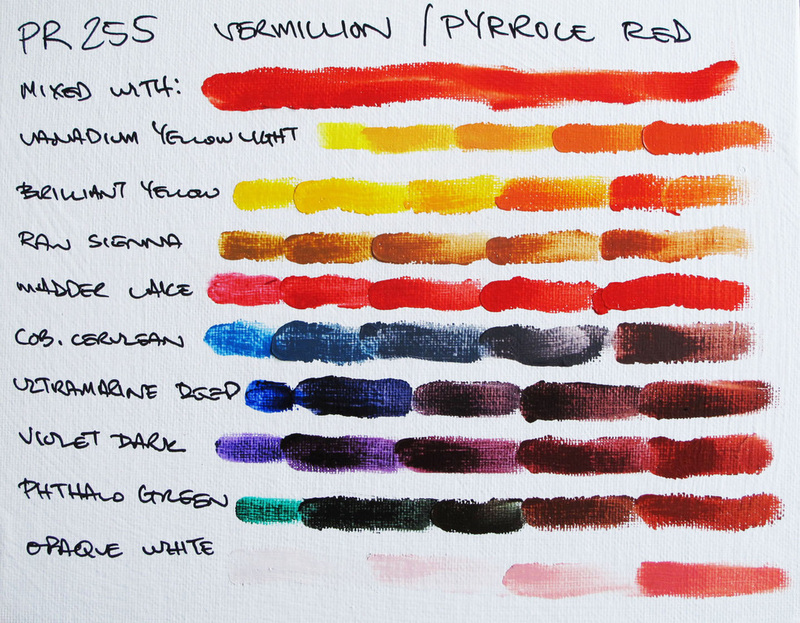 PY216 can be mixed to make muted, warm, opaque tones of an earthy character. Hot transparent colours, such as Madder Light (PR209), can be added to provide a fiery undertone. Reductions with white produce delicate flesh tints. 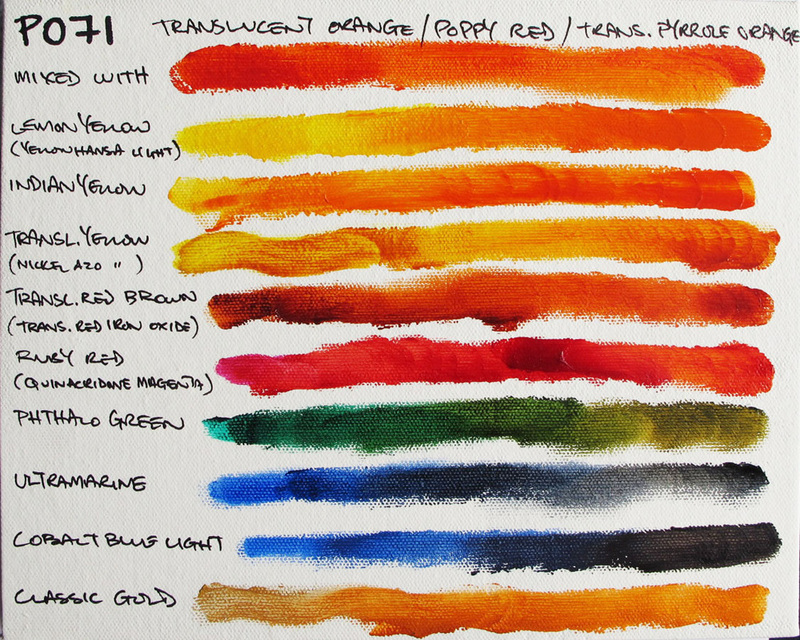 PO71 is a rare translucent orange - most oranges are opaque - and so makes an important addition to your palette, for glazing, reducing the value of blues (most of which are also translucent), and hotting up colours. 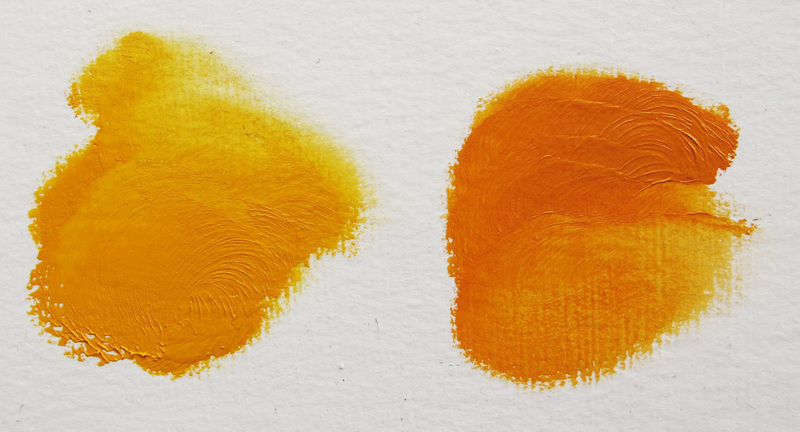 Golden call it Transparent Pyrrole Orange in their acrylics; Schmincke call it Translucent Orange and also Poppy Red (Norma Oilcolours). Mixing it with Lemon Yellow creates the widest range of yellows to oranges, though most fiery are the mixtures with Indian or Translucent Yellows. Oranges through to reds are achieved with Quinacridone Magenta, and some good landscape greens with Phthalo Green. PO71 is perfect for darkening blues through to translucent blacks. 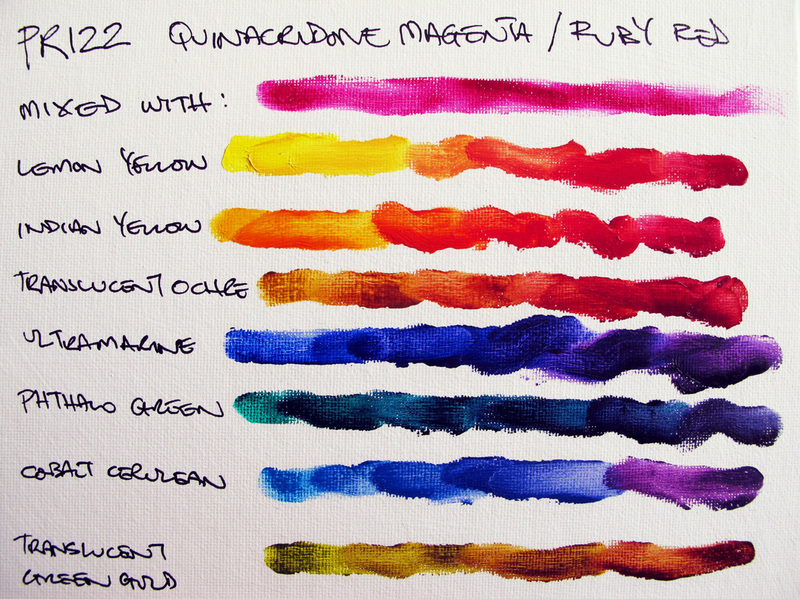 PR122 is called Translucent or Quinacridone Magenta, or Ruby Red. 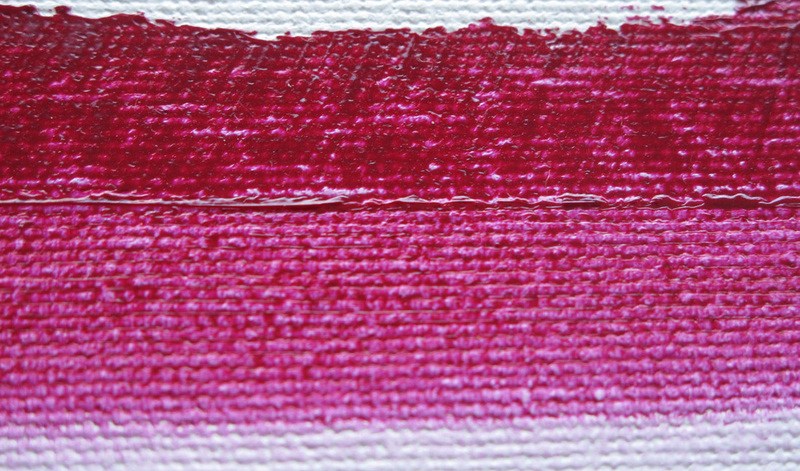 This intense magenta is a clean mixing colour that you can use as a primary red. Mixing with yellows brings PR122 into the "fire-engine" red area, through to good oranges. It mixes with blues to produce good violets, and even makes a slate blue combined with Phthalo Green! PR255 is a modern Pyrrole pigment that is used as a replacement for mercuric-sulphide (highly toxic) in making the colour Vermillion in, for instance Schmincke Mussini Resin-oilcolours. PR255 is a 21st Century colour! It is an intense warm red, mostly opaque, and with very high lightfastness. Being so strong, PR255 mixes well with other modern opaque colours such as Vanadium Yellow for brilliant oranges, and is even a match for high-tinting strength colours like Phthalo Green, where it combines to make inky greens and warm blacks. Some particularly lovely purples can be made mixing it with Violet Dark PV23 (Dioxazine). A nice trick with colour mixing is to combine both warm & cool colours in the same hue – Vermillion and Madder Lake above – to achieve really high chroma. 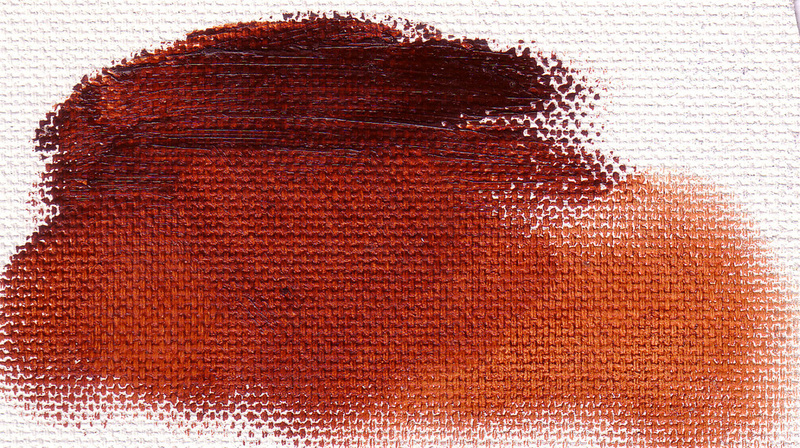 PR264 is an ultra-new pigment, introduced by Schmincke in their Norma Oil range in 2009 (Madder Ruby) and by Golden Acrylics (Pyrrole Red Deep) in 2010. A very deep, translucent red. PR264 mixes really well with yellows, deepening them cleanly through to the oranges. It produces fiery red earth tones when mixed with yellow earths, and makes very interesting purples when combined with single pigment blues. 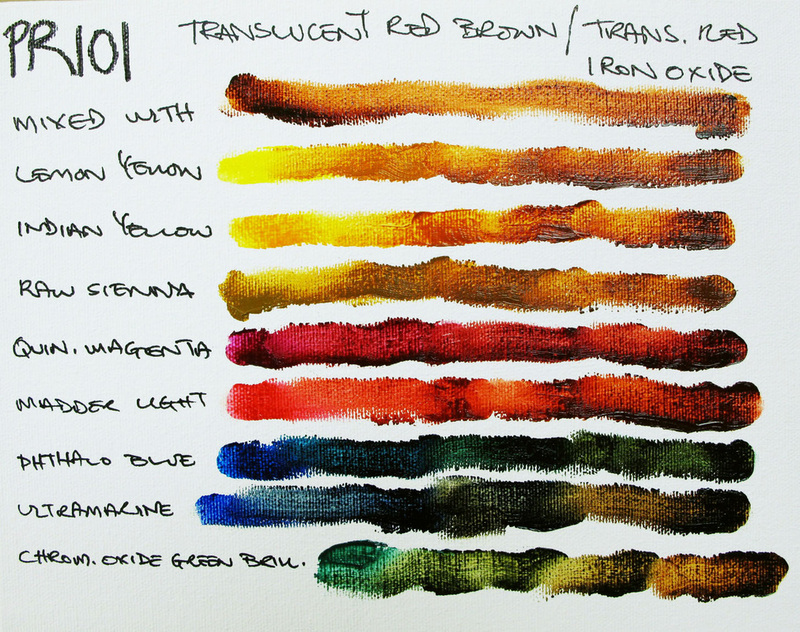 PR101 is a very versatile pigment, made from iron oxide, which produces shades from orange-red through to violet-red, depending on how the pigment is processed. This example is called Translucent Red Brown or Translucent Red Iron Oxide. Most of the other shades are opaque, but this is fiery red in undertone, making it great for adding a rich depth to colours, either in a glaze or as a mixture. PR101 as a translucent hue makes a very good base for pakeha and pacifika skin tones. It’s a valuable colour for landscape painting, producing remarkable greens when mixed with blues, and acts like an orange when combined with cool reds. One of the main inorganic violets available, PV14 Cobalt Violet is extremely expensive, but provides a unique semi-opaque red-violet that is rich in mass-tone and delicate in under-tone. PV15 Ultramarine Violet is made from the ashes of ultramarine and is a transparent blue-violet. 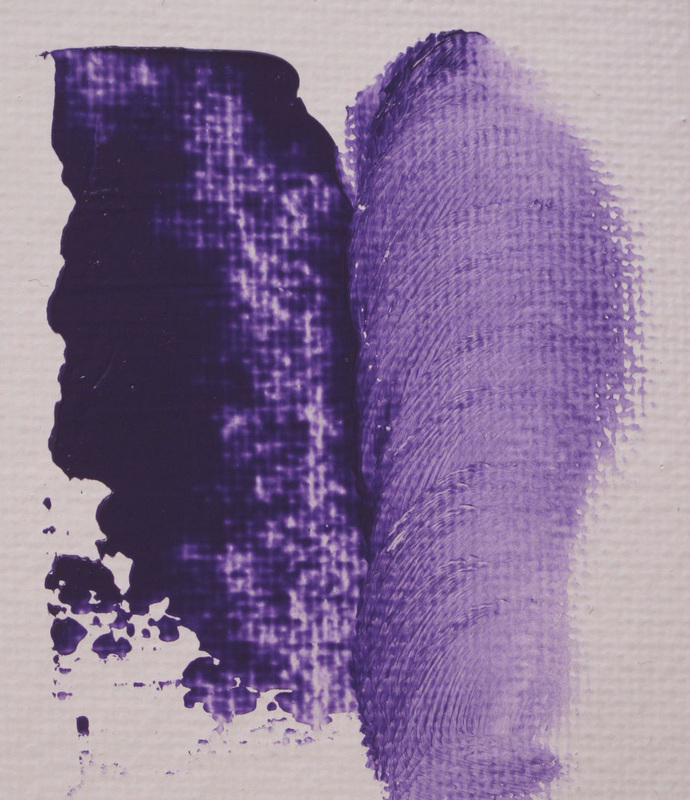 Like Cobalt Violet, this pigment has weak tinting strength, so work best alone either as a glaze, scumble or body colour. 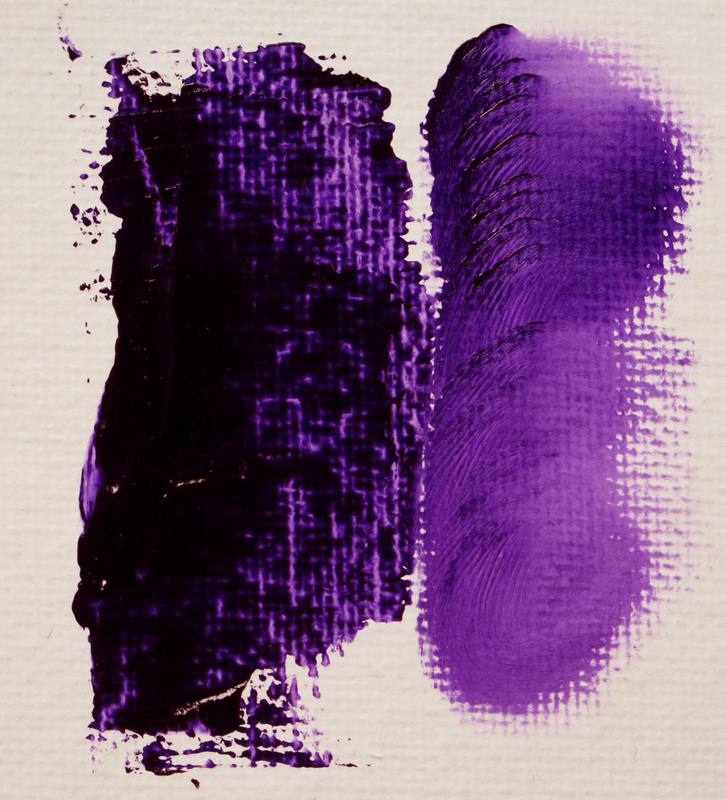 PV19 Quinacridone Violet is one of the main two Organic Violet pigments, representing the red-violets . Both are transparent and are excellent mixed with blues and reds to produce a larger range of purples, or to darken yellows. 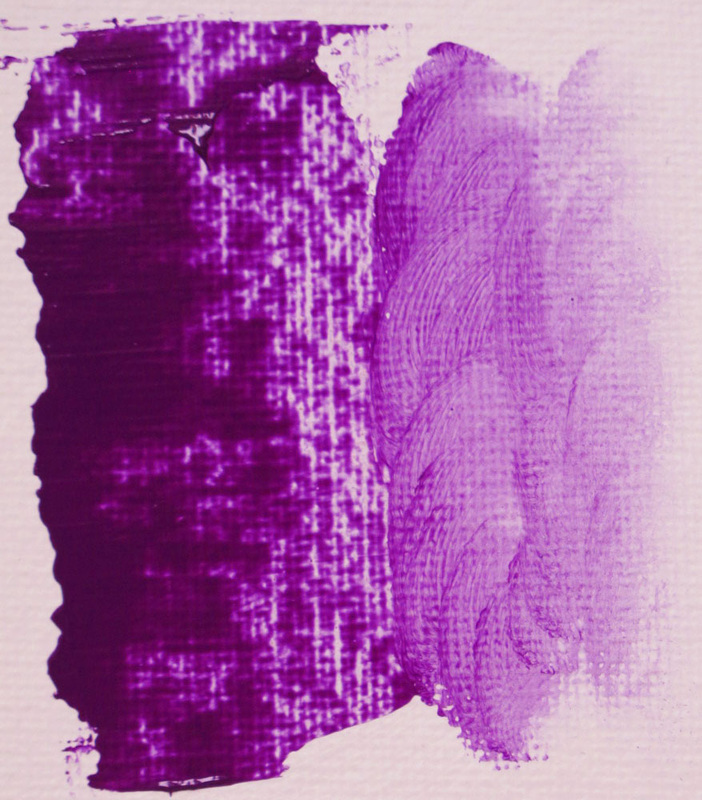 PV23 is the main Organic Violet pigment used, representing the blue-violets. It is transparent and excellent mixed with blues and reds to produce a larger range of purples, or to darken yellows. 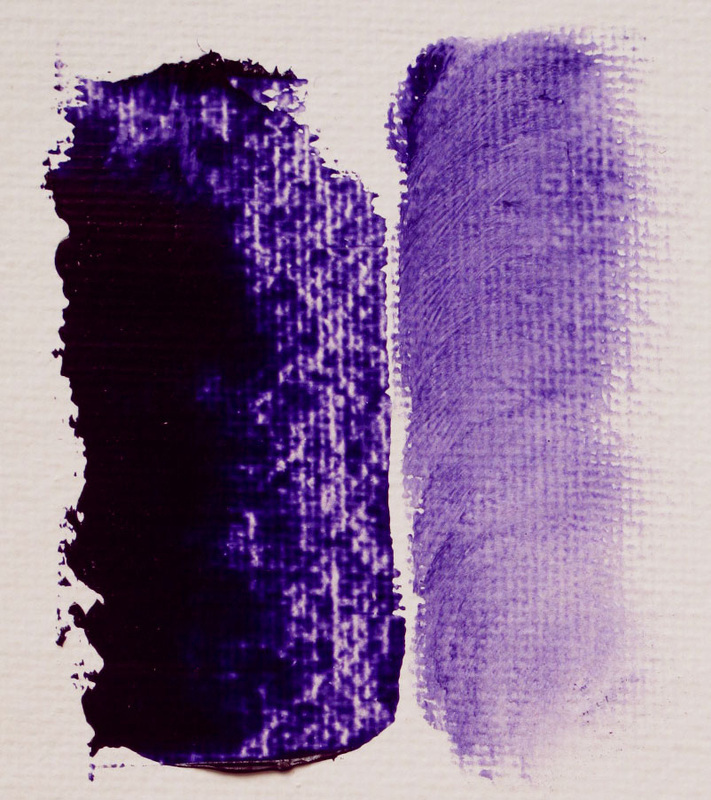 Apatite is a new pigment, used uniquely by Schmincke for their Norma Professional Oilcolour Cobalt Violet Hue. It has yet to be classified, but I can tell you it is a semi-opaque colour with weak tinting strength, and very useful for shadows! 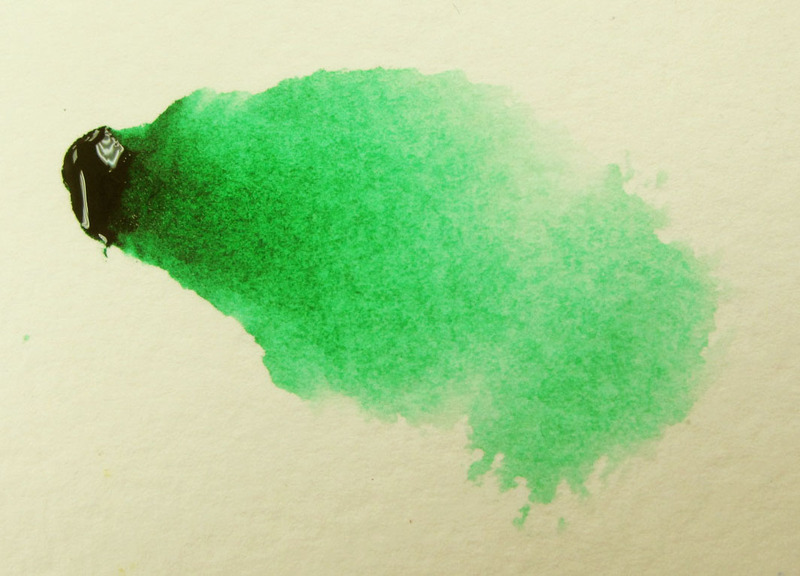 PB15:3 is Phthalo Blue (green shade), which is considered the primary cool mixing blue. Here it’s shown on the left and mixed with white on the right. 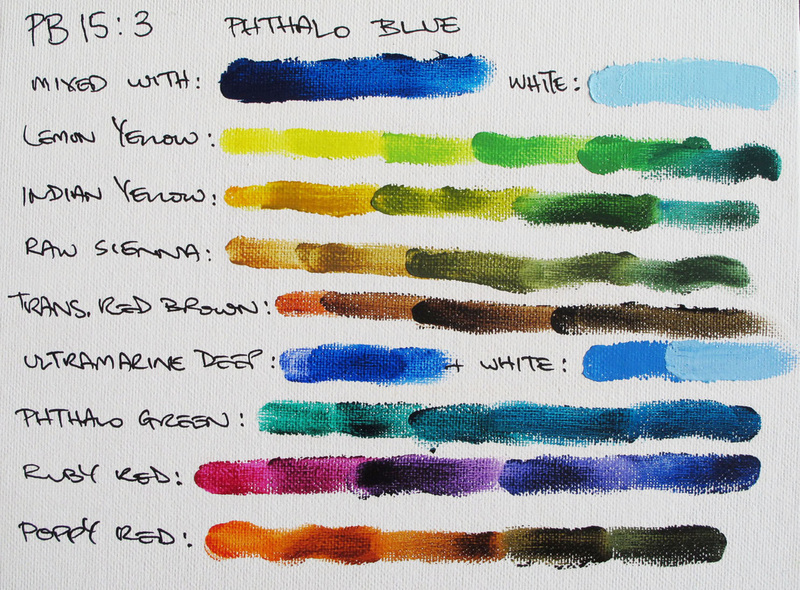 Phthalo Blue has a very high tinting strength, so just a small amount in a mixture really changes the colour. Phthalo Blue makes a wide range of greens, from bright acidic hues when mixed with Lemon Yellow (PY3) through to olive and sap landscape greens when combined with yellow earth tones, such as Raw Sienna. Turquoise blues & greens are made by mixing it with Phthalo Green, and Cerulean by adding white to the bluest turquoises. Combining Phthalo Blue with warm blues such as Ultramarine and white results in lovely Royal Blue shades. PB28 is Cobalt Blue Light, first developed in 1802 from blue crystals that grew in lead mines (hence “Kobald”, a subterranean dragon), and an important colour alternative to Ultramarine in the 19th Century. Less red & dark than Cobalt Blue Deep (PB74), PB28 is a semi-opaque, inorganic, warm blue that’s very useful in itself as a rich blue, and also in producing muted mixtures. It is imitated in Cobalt Blue Hue through mixtures of Ultramarine & Phthalo pigments. Cobalt Blue Light creates beautiful pale tints with white. In the 19th Century, it was often mixed with black and then reduced with white for skies. Muted landscape greens are easily mixed from yellows, and somber purples with opaque reds. It produces delicate turquoise hues with transparent greens, and can be darkened with P071 (Poppy Red or Translucent Pyrrole Orange). 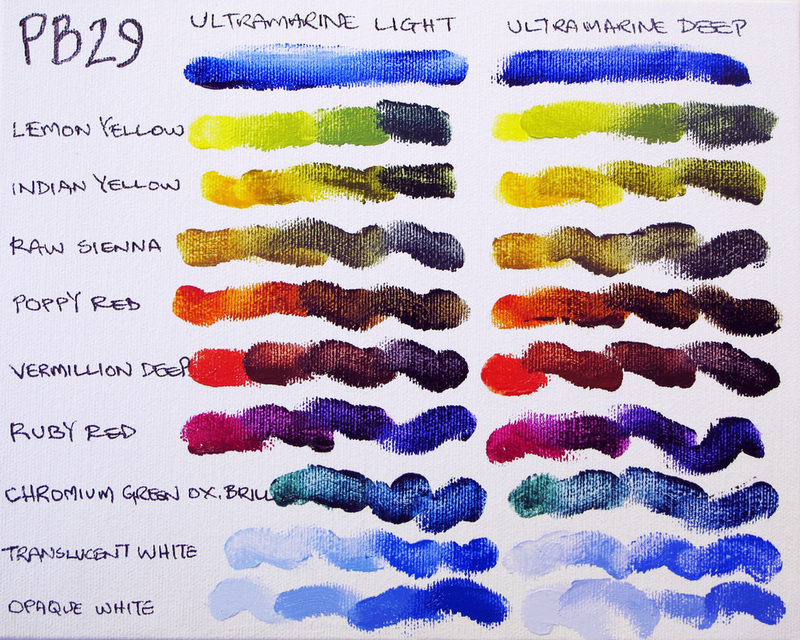 PB29 is Ultramarine, which is available in two shades – Light and Deep. The Deep is what most people recognize as Ultramarine, a deep reddish blue. The Light is a more neutral tone. 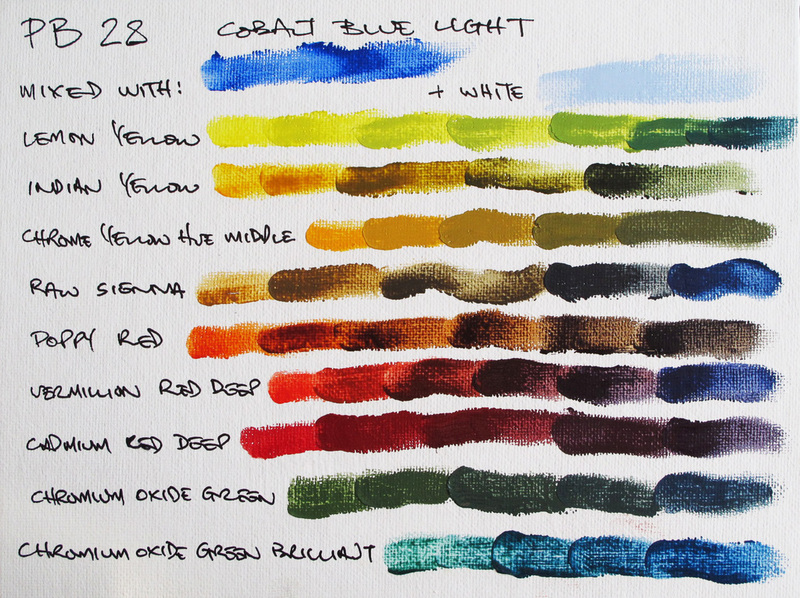 When used for mixing, Ultramarine Light produces cooler tints and the Deep warmer ones. The most amazing range of violets are produced with Ruby Red (Quinacridone Magenta for acrylic painters). Unfortunately, blues do not reproduce well, with most of the purple tones dropping out, so these mixtures are best viewed on the actual colour board in-store! PB60 Anthraquinone/Indanthrene/Delft Blue is a muted, transparent, warm blue. It's a good alternative for Ultramarine when needing less chroma. We love mixing it with transparent orange to make transparent blacks! 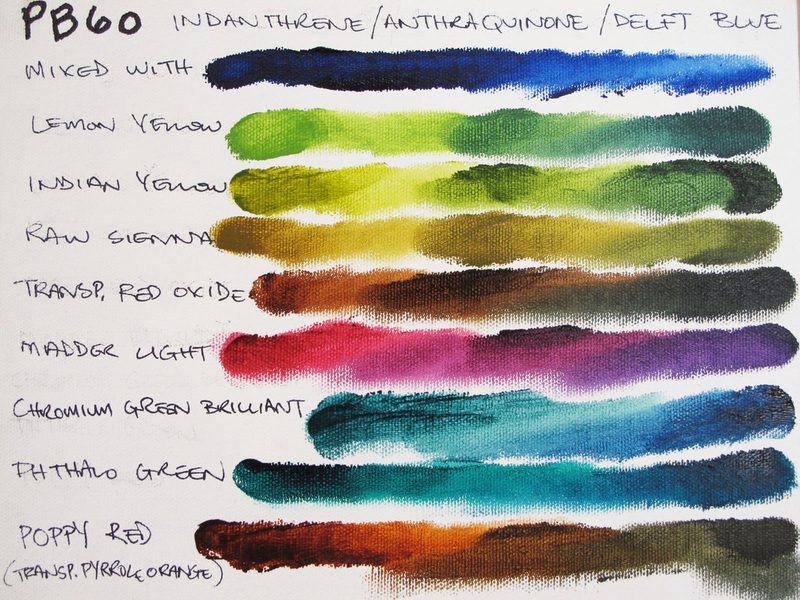 PB60 mixes cleanly with other colours to produce beautiful green-golds, red violets, and turquoises. Mmmmm! This colour was our Blue of the Year 2010. 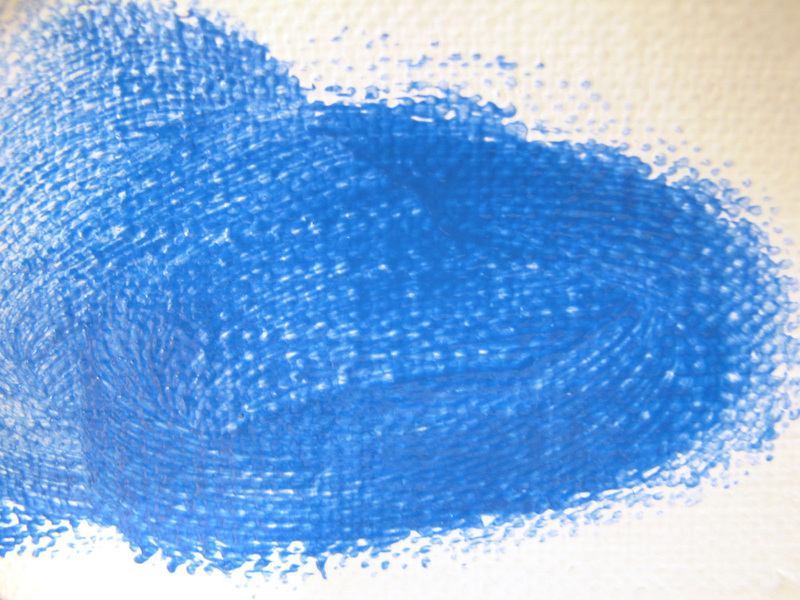 PB36 Cerulean Blue Chromium or Cobalt Cerulean is a slightly muted inorganic blue. This is the real deal - most Cerulean is a mixture of Phthalo Blue, Phthalo Green and a bit of white, but the real thing is much more subtle! 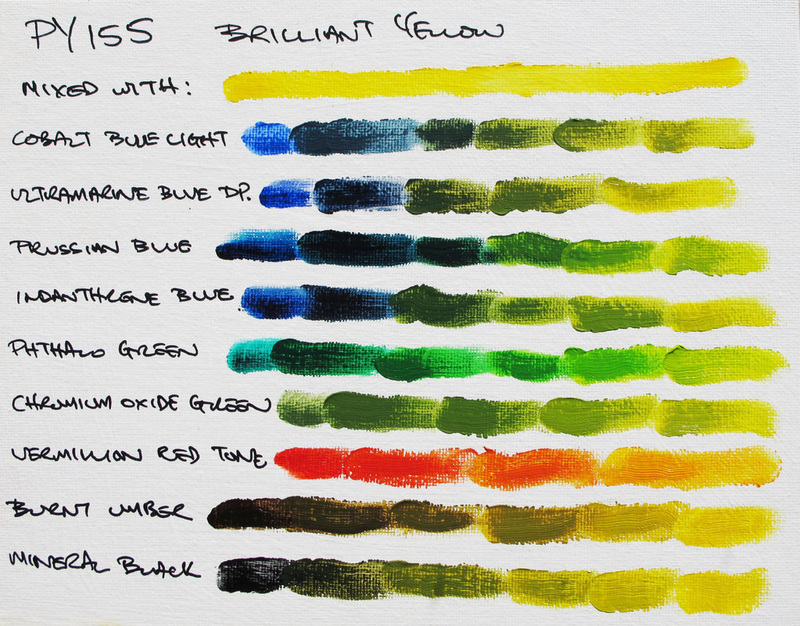 Being an inorganic pigment, PB36 produces mostly muted, opaque mixtures, with the exception of combinations with Cadmium Lemon colours. 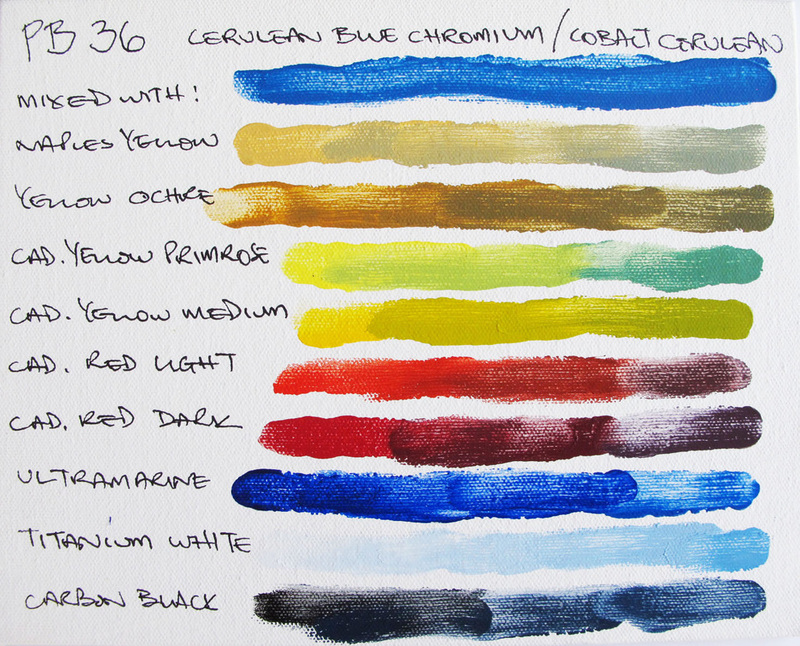 We love the greys achieved with Naples Yellow, and the Royal Blue when reduced with Titanium White. 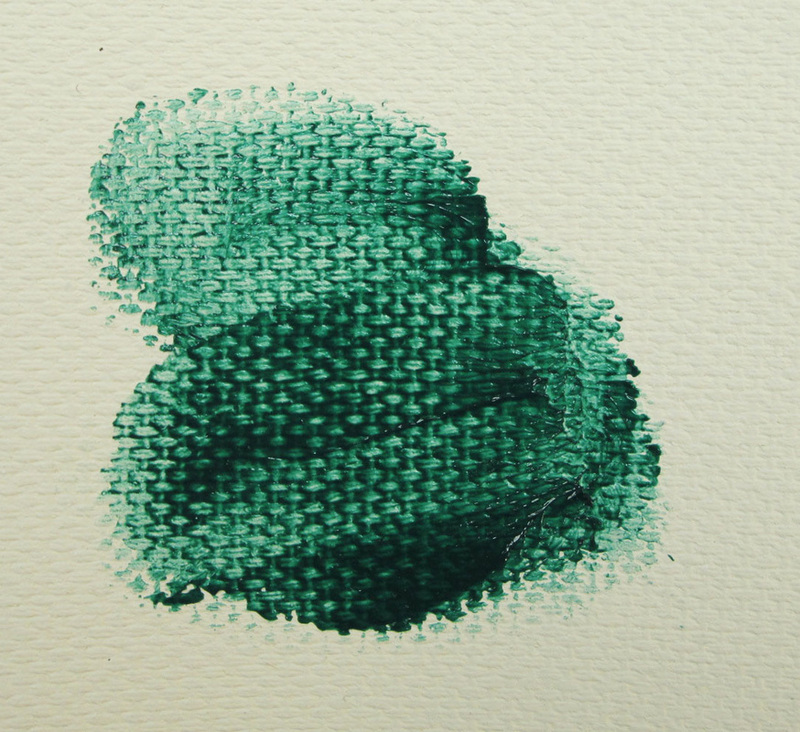 Phthalo Green (Blue Shade) PG7 (sometimes called Helio Green Deep) is an intense emerald green and an important mixing colour. It has a very high tinting strength, so a little in the mix goes a long way. 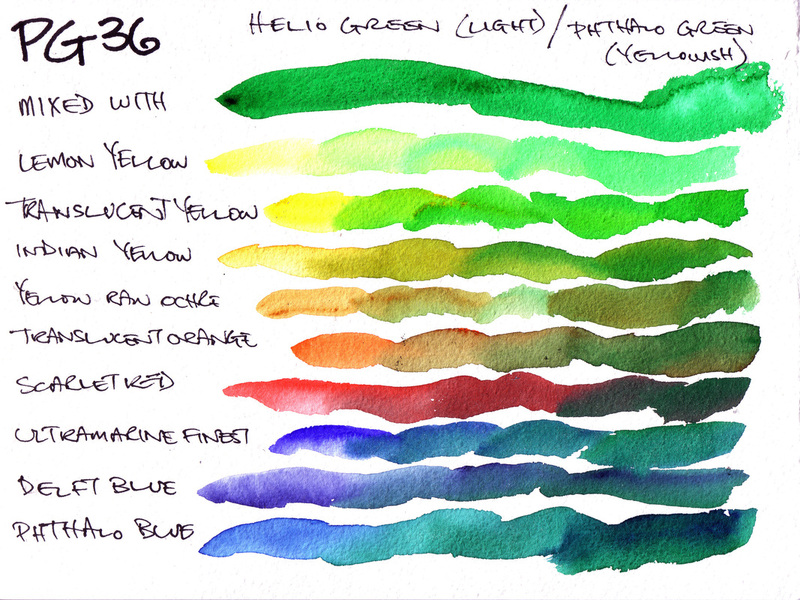 Phthalo Green mixes with various yellows to produce a wide range of useful greens. It deepens red shades, right through to black, and is useful in greying pinks so they're not to garish. It can even be used to produce purples and blues! 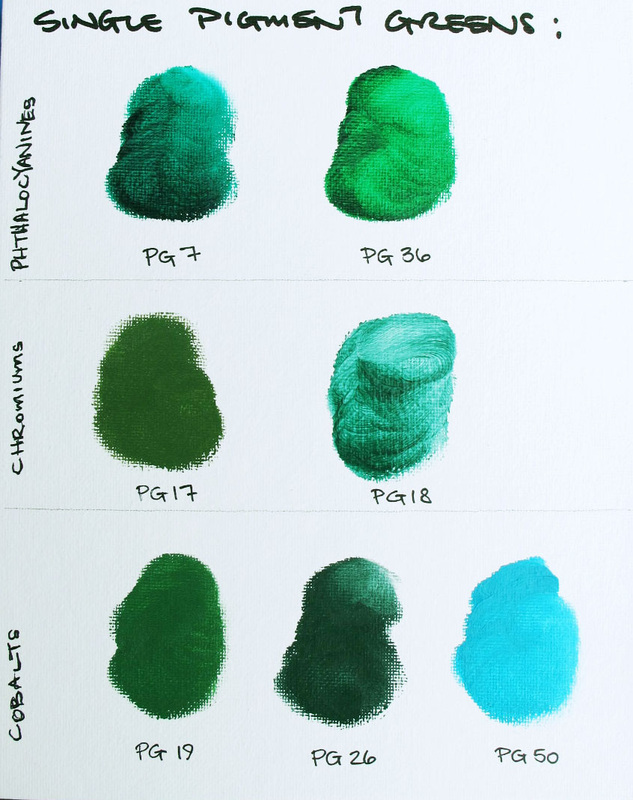 PG36 is the yellowish version of Phthalo Green, and provides warmer mixtures than its cooler sibling. Between the two of them, almost every shade of green can be made. The four different yellows mix to provide very different greens, from bright neon to warm landscape tones, and even the orange combines to produce interesting earth greens. PG36 darkens red in a similar fashion to PG7, and makes warmer turquoise colours when mixed with blues. Chromium Green Oxide Brilliant PG18 is a bluish-green with a low tinting strength. First discovered in the 19th Century, it quickly became a popular colour for mixing a range of greens. Its low tinting strength also lends it to toning flesh colours. 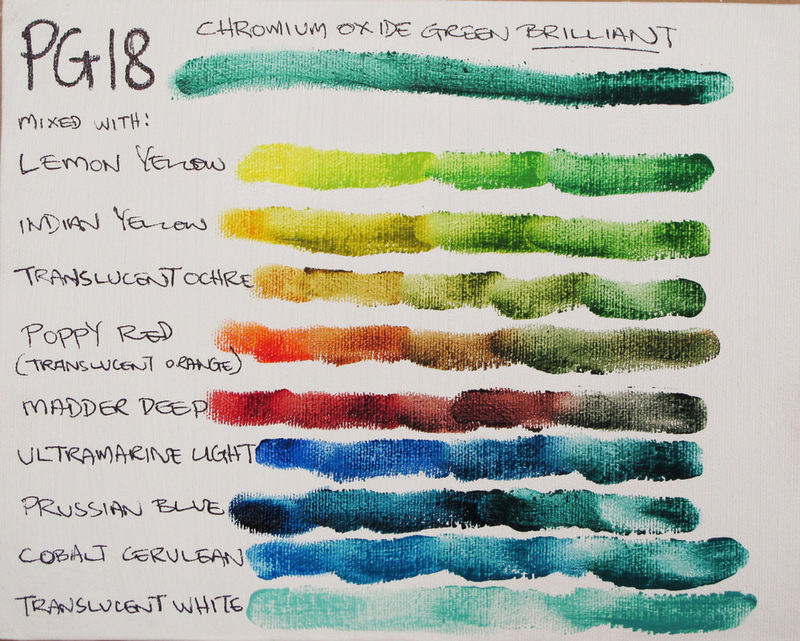 Note the “brilliant” on the end – Chromium Green Oxide PG17 is a very different green! Chromium Green Oxide Brilliant is best mixed with other translucent colours, to preserve its glowing bluish quality. As well as mixing a good range of greens, it tones down red nicely, and produces turquoise hues when combined with blues. 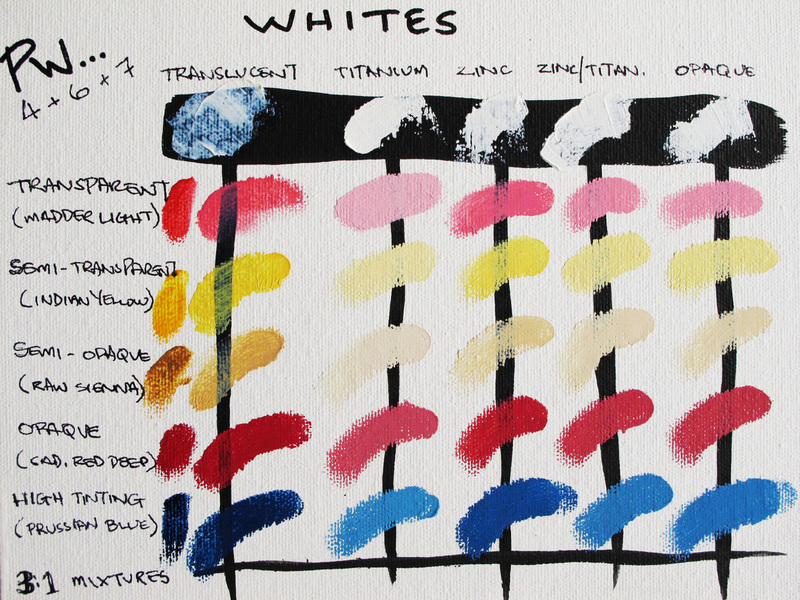 Norma Professional Oilcolours offer five different whites! Most people reach for a tube of Titanium White, and the Norma is beautifully smooth and brilliant. Titanium is very stable, opaque and with a high tinting strength. Zinc White is more subtle, and where Titanium can make colours seem pastel, Zinc keeps the colour’s chroma more intact. Zinc Oxide can be problematic, however, and is best used thinly, as it can embrittle and have surface-tension issues. Zinc-Titanium White combines the best of these two pigments – more subtle than Titanium, but with Titanium’s stability, this is an excellent all-round white for mixing and for highlights. Translucent White maintains the glazing qualities of translucent colours while still lightening them, making this a very useful white. Translucent White can also be used to create veils and smoky effects in painting. Opaque White is a unique, soft and clear white, which is great for lightening opaque and high-tinting strength colours. Opaque White tends to maintain the colour’s chroma more than Titanium, and is much more stable than Zinc Oxide. 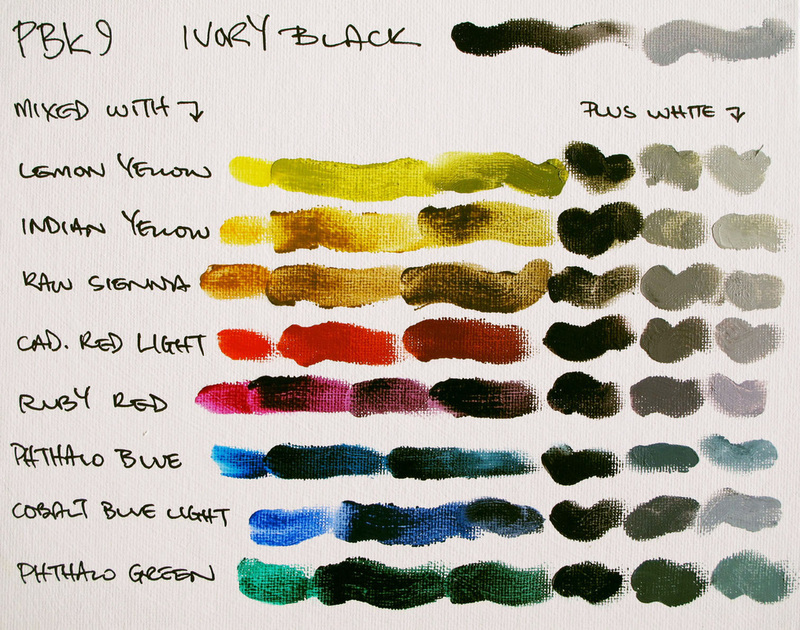 Ivory Black PBk9 is the most popular black, and has been an important pigment for millennia. Although using black straight from the tube can often result in a black that does not sit well with other colours, Ivory Black is a most effective mixing colour. Just a speck of black added to yellow creates bright greens, and natural earth colours that sit well in landscape painting when combined with yellow earths, such as Raw Sienna. Black is good for darkening reds and lends a sinister aspect to Phthalo Blue. Successful sky tones can be achieved using Cobalt Blue with some black added, then reduced with white. Combining black with other colours and reducing with white produces many shades of cool & warm grey. Iridescent Gold offers many metallic effects. Care should be taken when introducing gold into a painting, as the eye is instantly drawn there, often to the detriment of the other colours. This is why the representation of gold by master painters is made using yellows, greens and blacks. One way to incorporate gold into a painting so that it harmonises with other non-metallic colours, is to mix it with those colours. 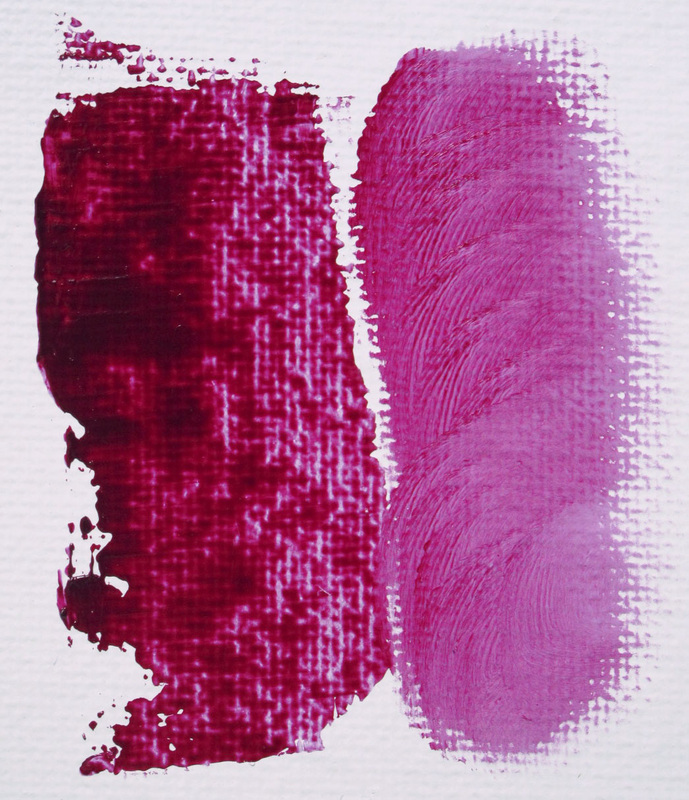 Here gold has been mixed with Quinacridone Magenta (left) and Manganese Blue (right) to achieve unique metallic hues. The proportion used was approximately 5:1 metallic:standard colour. Iridescent Silver is usually made from aluminium or coated mica flakes, to provide a non-tarnishing bright silver. Iridescent Silver mixes with other colours to achieve cooler metallic hues than the gold, and is especially useful for pearlescent effects. In the Golden Acrylics range, metallics are also available in a “coarse” option. This is their Stainless Steel Coarse, and the actual grains of stainless steel are apparent, giving a rough, more physical effect than, for instance, the Iridescent Silver (above). The Stainless Steel Coarse mixes with non-metallic colours to produce a two-toned result, where the grainy steel is obvious in the masstone and the colour more so in the undertone, contributing more depth to these metallic options. Interference colours interfere with white light, causing a “flip-flop” effect on a white surface. Interference Violet (above left) changes between violet and green, depending on the angle it’s seen on. These strange colours don’t follow the same rules of mixing as usual colours. If you mix a violet and a green together, you’d normally get brown, but here even a very small amount of green turns the Interference Violet… green! This is because there is no violet pigment involved, rather: an interference with the wavelength of violet light.